I’ve been sick all week with a cold, but went out yesterday afternoon to rake the front gardens. Dug the leaf rake out of the garage, located a few yard waste bags, brought out the pruning secateurs, and found one remaining pair of wearable gardening gloves (I buy them in bunches each spring at the dollar store, but more seem to disappear over the year than ever actually wear out). Every fall I pile fallen leaves onto the garden for winter insulation. The challenge, in the spring, is to rake them off at just the right time. 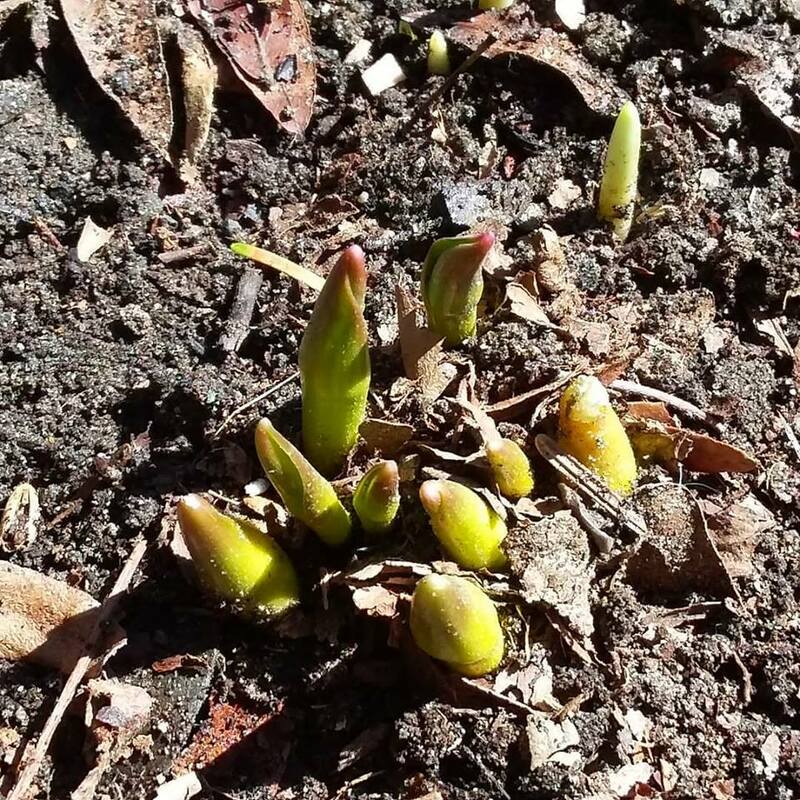 Too early and sprouting greens may end up frost-bitten; too late and the bulb tips will already have begun poking into the leaf litter and get nipped off by the rake. The prefect day to rake is a mild, sunny day followed by rain, and yesterday was mild and sunny, while today a light mist is falling. While raking, the only signs of life I noticed were thin green strands of scilla (squill) marshaling themselves for the season. But ten minutes after I had finished raking, the tips of crocus had begun to appear all over the garden. This morning it was raining lightly, and overnight the front garden had grown a green cast. Bulbs are popping up all over–crocus, scilla, tulips, narcissus, hyacinth–and so too are the green beginnings of dame’s rocket, goldenrod, echninacea, bergamot, creeping Charlie, iris, mint and serpent garlic. For several years I have planned to dig up and reset the front garden, which has grown rather wild. But getting the timing right will be just as important as it is when first raking the leaves off in the spring. Too early and there’s the risk of digging over plants worth keeping; too late and the soil will have grown hard with midsummer drought. I’m not quite sure what I’d like for the front garden. It enjoys a west and south exposure but is lightly shaded by our large honey locust tree. Years ago we designed it around a large, elevated slab of limestone atop which sits a sundial. This edifice is surrounded by a ring of limestone meant to serve as a walkway, but the some of the limestone has gotten buried and the walkway was too narrow to be practical. I am thinking, I suppose, of renewing the garden as a quadrant, perhaps with more perennial herbs toward the front alongside perennial flowers. I do like the wild English garden effect, and so do the cats who lie hidden in it on hot days, but think it could also work better if it was just slightly more formal. Something to dream out in the coming weeks, I think.